When you right-click a file name or a thumbnail in Microsoft Windows XP, you see a shortcut menu for that file. One of the items on the menu is Send To, which enables you to quickly e-mail a file, copy it to your desktop, compress it or copy it to a floppy disk. You may want to save a copy of the file to a specific folder on your computer. If you have a folder where you frequently place files, you can add that folder’s name to the list of locations on the Send To menu. 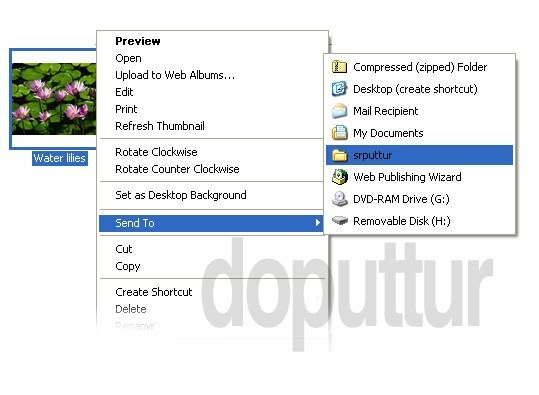 This can save you the time of opening another Windows Explorer window and copying the file from one folder to another. 1. In the My Computer window, click the Tools menu, and then click Folder Options. Click the View tab. Under Hidden files and folders, click Show hidden files and folders, and then click OK.
2. In the My Computer window, double-click Local Disk (C:), double-click Documents and Settings, double-click your user name, and then double-click SendTo. 3. Click the File menu, click New, and then click Shortcut. 4. The Create Shortcut Wizard appears. Click the Browse button. 5. In the Browse For Folder dialog box, click the folder you want to add to your Send To menu, and then click OK.
6. Click Next-> Click Finish. Alternatively, you can create a shortcut for your folder at the location of the folder by right clicking and selecting the option Send to Desktop. 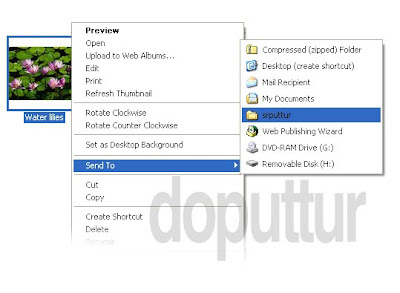 From Desktop, the shortcut can be copied and pasted in Send To folder. Now when you right-click a file and click Send To, the destination you selected will be an option on the Send To menu. You can create shortcuts to local or network programs, files, folders, computers, or Internet addresses.